I feel like I need full discosure here. At Star Hill we have terrible dirt. It is clay and as far as I can tell the only thing that loves it is pine trees. Also, we do not have trash service at Star Hill. We are too cheap to pay for trash pick up at two houses. Those two facts along with giving birth to the Southern Belle who is VERY eco-friendly has led us to compost at the lakehouse. Inside the house we have two trash cans; recycle and trash. We bring all that home and put it out by our curb. 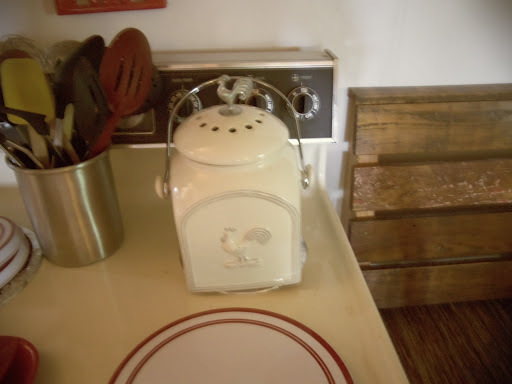 We also have a compost jar. For a long time I just had a big bean pot that we put all vegetable scraps in, but my social planner suprised me with this one two weeks ago. It even has a charcoal filter in the lid. Fancy. 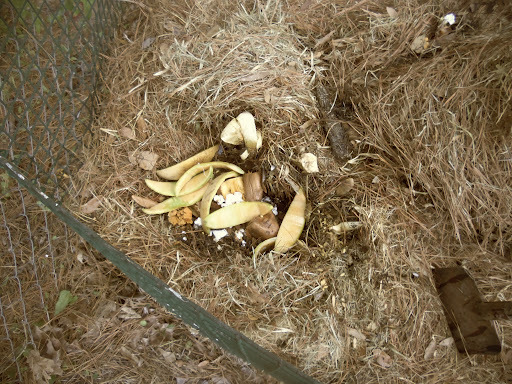 It is kind of gross to look at, but I wanted you to see what goes in to the compost pot. 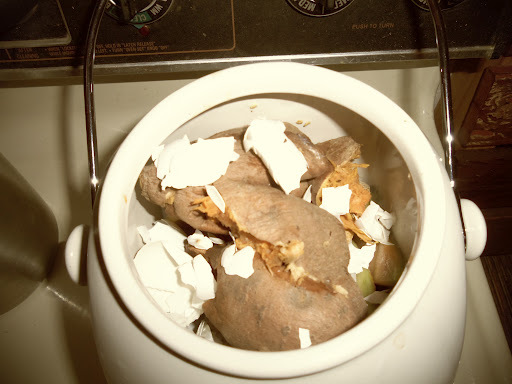 Potato peels, cantalope rinds and seeds, egg shells, cilantro stems, jalapeno seeds and stems, apple cores, and onion skins were in the pot this weekend. 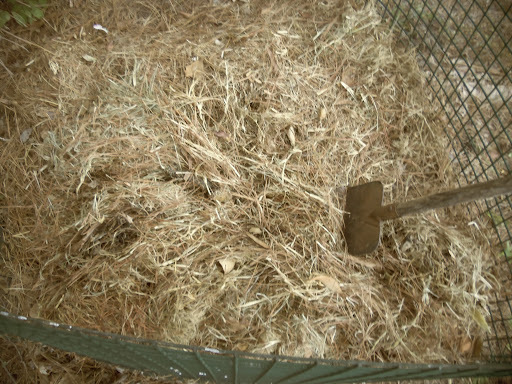 We know that we do not follow any of the composting rules. My parents are champion composters. 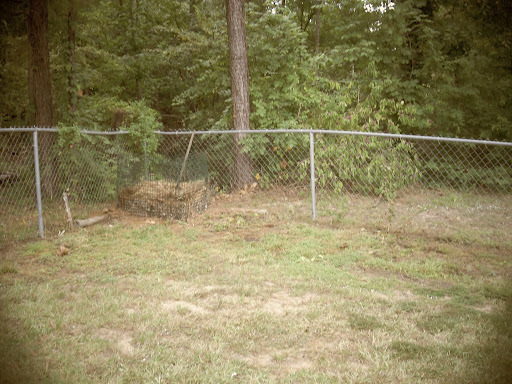 They have been composting for years. The cage we have does not have a center post. It was free and the post was missing. It is supposed to have a cener wire square post that allows for air circulation. We have to stir our compost from time to time. 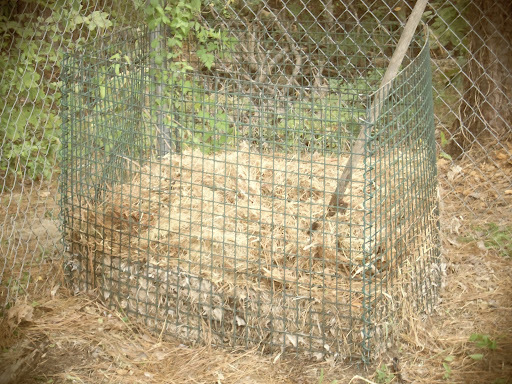 The compost cage is located in the backyard near the creek that runs through the back of the property. Not attractive but out of the way. The stuff really packs down quicky. We add stuff all the time and it is rarely over 1/2 full. We do not bag our grass clippings. Our mover mulches them back into the yard but our neighbors have a lawn service that bagges their lawn clippings. About once every two or three months we bring up a bag of clippings. The nitrogen is good for the compost. It looks like we need more soon. I dug into the compost so that you could see the dirt that is being made. 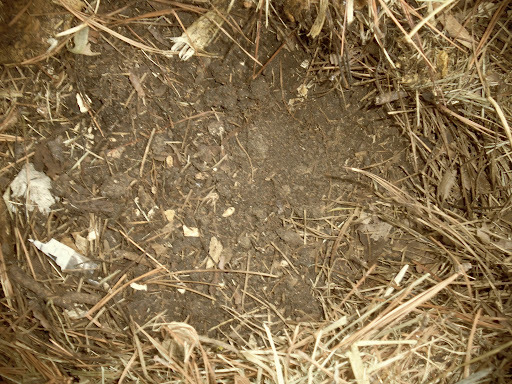 When we need dirt, we just dig deep into the compost and add it to any holes we dig. The soil is rich and loose and the plants love it. We are also getting ready for our first fall garden so we will be using the compost a lot. Here are the vegetable scraps from the weekend. After they are added, I just have to cover it with the grass clippings. During the summer when it is hot and dry we water the compost every once in a while. The moitture helps break everything down. Having the compost up at Star Hill makes me feel guilty for not doing it at home, but it hasn’t happened yet.